Every Monday's a school day with our One Minute Monday blog, where we illuminate one fact from the world of employment and skills in under a minute. The number of people over 50 years old in employment has been steadily rising since 2004. Employment rates in the over 50s rose even during the recession when employment rates fell for those aged between 25 and 49 fell. Put simply, the UK workforce is ageing and people past traditional retirement age are continuing to work (1 in 5 of Brits aged 65-69 are now in employment). The post-war increase in life expectancy, and better healthcare and educational opportunities have supported this demographic shift. The increase in the number of older people in employment means that workplaces are likely to become more intergenerational - many will have workforces spanning four generations. This trend looks set to continue: our Future of Work study predicts the number of economically active people over 65 will increase by a third over the next decade. 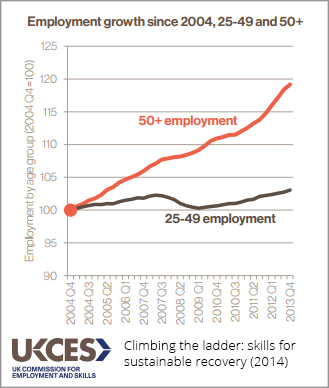 Read our full report to find out more about the skills and demographic challenges facing the UK.